Abhishek Bachchan, who has had more misses than hits in his 10-year-old acting career, says he never thought he would be able to survive this long in the Hindi film industry. "I never thought I would make it through 10 years. I didn't think they would give me a chance," Abhishek, the son of megastar Amitabh Bachchan and seasoned actress Jaya Bachchan who made a not-so-successful debut with "Refugee" in 2000, told IANS in an interview. "I didn't think I would get any films after my first film. I genuinely didn't believe it. I haven't really given them any reason to like me or like my work; so why should they spend their time and effort on me?" said the actor who is being appreciated for his performance as freedom fighter Surjya Sen in his just released "Khelein Hum Jee Jaan Sey". 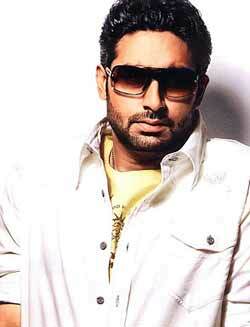 For Abhishek, acting is a tough job, but he believes he has grown up as a better actor in the last decade. "I find all my films difficult. Acting is very tough. I think you should always challenge yourself with every film. If you don't, then you will start stagnating. I want to do films which will push me every day to work harder; so I find every film harder," said the actor. Though Abhishek had a shaky start, he tried to find a firm foothold in filmdom with box-office successes like "Yuva", "Bluffmaster", "Dhoom", "Bunty Aur Babli", "Sarkar", "Guru" and "Dostana". "I would like to believe that I learnt a lot. I can definitely say I am a better actor today than I was in 'Refugee' - 100 percent. If you are not improving with every film, then there is something seriously wrong with you. "I see my father today - after 40 years in the industry and having done over a hundred films, he still tries to do better than his last performance. That's what you have to keep doing," he said. The 34-year-old does not shy away from admitting that the failure of a film takes a huge toll on his confidence.
" 'Raavan' was one of the toughest films I have ever made. I had really worked hard for it; so did everybody. When a film doesn't work, it really hurts. It's disappointing, it ruins your confidence. It takes a huge toll on an actor and then to come up and face the camera again takes a huge amount of courage and effort," he said. Abhishek also revealed he finds it difficult to swiftly shift from one character to another and he always carries some trait of his previous character to the subsequent one. "I think you put a lot of yourself into a character and you take back a lot. Whatever you take back, somewhere or the other it is used in the next character you are doing. May be in a different form. It's difficult to shift from one character to the other very fast. But it's not insurmountable," he said. All said and done, Abhishek is determined to stay and play a long innings. He has a handful of projects, including "Game", "Dum Maro Dum" and "Players" - all of them will release one after another in 2011.